Earlier this year, I did a post about artifacts and relics after having seen an exhibition of a large number of them at my parish. It's a topic about which I have a lifelong fascination, aided in no small part due to the fact that Gary Gygax saw fit to include relics with miraculous powers in both OD&D and AD&D. 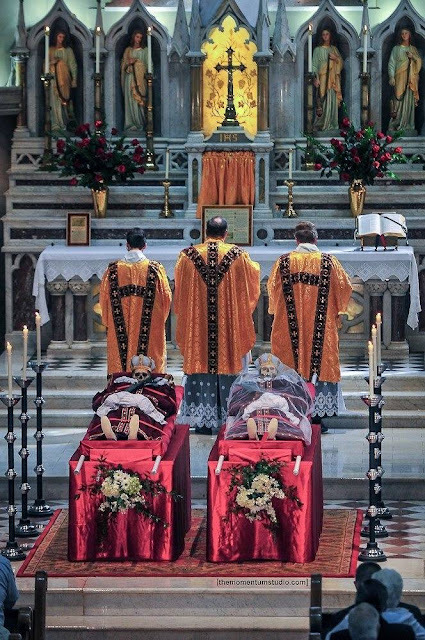 So, when I read a blog post by the pastor of a parish in Louisville, Kentucky, talking about the reinterment of the relics of two third-century Roman martyrs there, I wanted to share it. Be warned, though, that what follows has nothing directly to do with gaming and I share it out of interest, as I know there are quite a large number of students of ancient and medieval history amongst my readers. The saints being reinterred are Magnus and Bonosa, both martyred during the persecution of Septimius Severus in 207. According to tradition, Bonosa was a virgin arrested for her beliefs and Magnus a centurion who attempted to save her life. Both were thrown into Colosseum and met their deaths there. Their bodies were taken to the catacombs beneath Rome and later translated to a monastery in Agnani, Italy, where they remained the turn of the 20th century, when the monastery was confiscated by the Italian government and the order of nuns who resided there forced to leave. A pastor in the United States petitioned the Holy See for the relics and Pope Leo XIII agreed. The skeletons of the two saints were sent to Kentucky in 1901, where they've resided ever since. Recently, renovations to the church (Saint Martin of Tours) where the relics were displayed provided an opportunity to remove them, examine them further -- there were CT scans done of the remains, for example -- and reinter them with greater solemnity. The photo above is one of many from the reinterment Mass at the church. You can see both saints attired in new clothing and placed on biers before the altar. They have now been placed in glass reliquary cases at the sides of the church. Again, this has little to do with gaming as such, but it's fascinating stuff I thought worth sharing. Thanks for sharing it - more of this would be quite welcome, as I see it directly connects with the challenge of making relics more than fancy trinkets. Well if you haven't read Patrick Gearey's "Furta sacra" -- about the (surprisingly common) thefts of relics in the middle ages -- you might find some interesting grist for the adventure mill. There's something very Clark Ashton Smith about that picture. Fascinating. Was any dating done to confirm the age of the skeletons? Definitely worth posting. Just the journey their bones have been on is quite the thing.